The card reveals for Hearthstone's Kobolds & Catacombs expansion are underway, so Shacknews takes a look at Monday's new cards from the Hearthstone team. This is the week that Blizzard is set to begin new card reveals for Hearthstone's next expansion. Kobolds & Catacombs will introduce 135 new cards, utilizing a new Recruit mechanic and introducing a new Dungeon Run single-player adventure. It'll mark Hearthstone's seventh expansion and will be the final one issued in the Year of the Mammoth. As is tradition, Shacknews is breaking down the cards by the batch. As the card reveals from streamers and press outlets begin in earnest today, Monday saw the Hearthstone team start rolling out new card reveals. So with that, it's time for another round of analysis. After this minion attacks a hero, add a copy of it to your hand. Analysis: Eek! It's a gremlin! And it multiplies if it manages to go face. Fortunately, its stat line assures this will likely never happen. Not a lot to say here, but this one is highly unlikely to see play. There are much better 1-mana options out there. Like Wretched Tiller, it's an interesting idea on paper, but doesn't quite work out in practice. Secret: When a minion attacks your hero, instead it attacks one of its neighbors. Analysis: Because Rogue just doesn't have enough tools to ruin people's days, now it's getting Secrets. 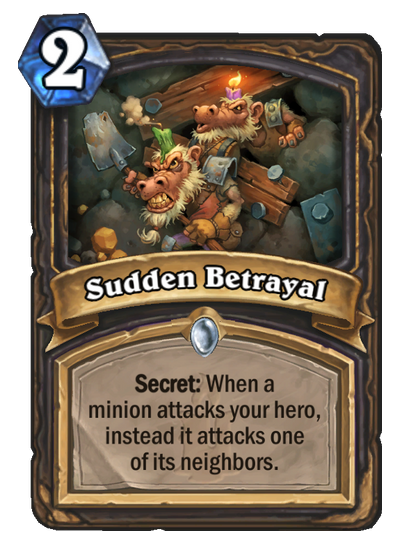 This Secret is meant to be an aggro deterrent, potentially having two opposing minions clear each other out. It can be a pain the rear and it's a toss-up whether it's worth playing this over the standard Betrayal spell. The trouble here is that this particular Secret doesn't seem to fit into a lot of Rogue decks at the moment. Miracle Rogue might find a place for this, but Keleseth and Jade Rogues won't really have anywhere to slot this. Secret: When a friendly minion dies, return it to your hand. It costs (2) less. 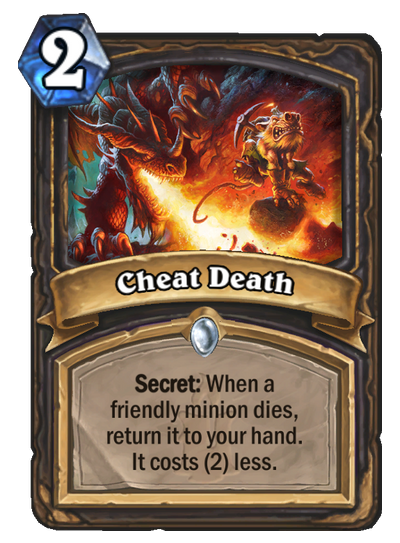 Analysis: This Rogue Secret is much more likely to see action, as it fits into a large number of Rogue decks. Miracle Rogues can use this to send their Gadgetzan Auctioneer or Questing Adventurer back into their hands. Other strong candidates for this card include Edwin VanCleef, Vilespine Slayer, and any number of the Rogue's Combo minions. But of course, this will definitely fit right in with the Aggro Rogue that's currently dominating the meta. Indeed, Rogue players can potentially use this to send Prince Keleseth back into their hand at a cheaper cost. Because after Shadowstep, Rogues need even more ways to keep dropping Prince Keleseth on the board. If all the pieces fall into place, Patches can be downright frightening. Battlecry: If you're holding a Dragon, deal 3 damage to all other minions. Analysis: Here's a new tool for Dragon Priests, albeit not one they may have expected. This is a fearsome area-of-effect Battlecry to stand up to those aggro decks, but it's an effect that also damages friendly minions. Priests will have to do something thinking before playing this card, assuming they don't just drop it on an empty board. Maybe drop a Devilsaur Egg on Turn 3, so it can be cracked on the next turn. 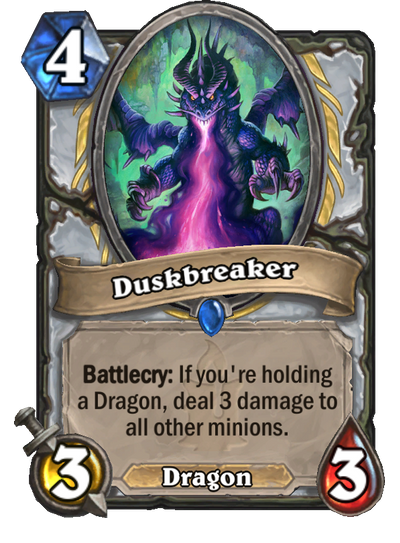 One thing to be wary of is that one shouldn't assume that Duskbreaker will swing the tide against Warriors. In fact, Warrior proves to be a problematic matchup for this minion. Some of the Warrior's key cards (the obvious Enrage minions aside) are out of reach of Duskbreaker's effect. Armorsmith will stay alive and Frothing Berserker is just grinning with glee at the prospect of Duskbreaker powering it up to oblivion. 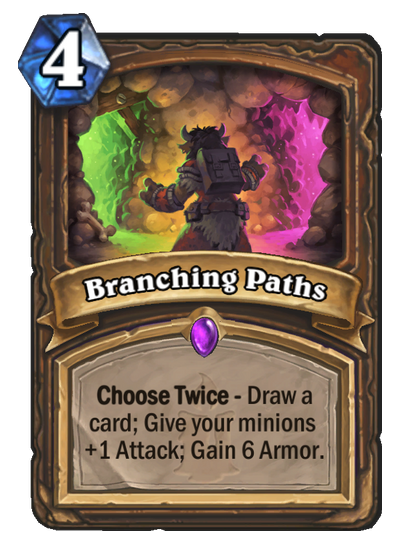 Analysis: This is a fascinating new mechanic for the Druid, as it introduces the first "Choose Twice" effect. It does differ quite a bit from its "Choose One" contemporaries, though. For one thing, it won't work with Fandral Staghelm, done in by the "Choose Twice" text loophole. (Fandral only works on "Choose One" minions.) But it also allows the Druid to select the same effect twice. That gives Branching Paths a utility of uses, but it'll be best used for the late game. It can buff up a board of aggro minions, but that makes it a much more expensive and more limited version of Mark of the Lotus and Power of the Wild. It's better used as a cheaper Nourish effect. It's also good for a whopping 12 Armor, which can be a life saver in the late game. It's also a quick way to buff up that Lesser Jasper Spellstone, which makes that spell even more appealing to Druid players. 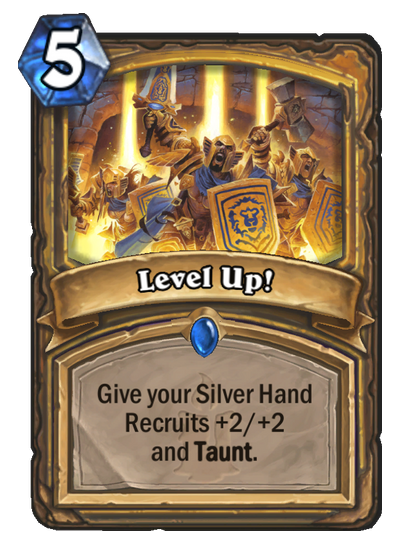 Give your Silver Hand Recruits +2/+2 and Taunt. Analysis: Level Up! is a Paladin spell that begs the question, "Just how much do you miss Quartermaster?" This is basically Quartermaster with an extra Taunt effect and without the 2/5 body. It's doubtful that Wild players will make the switch. Standard players may not find much space for this spell, either, especially since Sunkeeper Tarim provides practically the same function. What it does offer, however, is Taunt, which might be tempting given how things are swinging towards the aggro game again. But it's hard to see Paladins picking this spell up, given that there are better spells out there for their Silver Hand Recruits. Summon three 5/5 Mithril Golems. Analysis: It shouldn't be too difficult for the Warrior to complete the requirements for this spell. There are more than enough weapon choices out there. The reward isn't too shabby, either. The Greater Mithril Spellstone is basically a much beefier Doppelgangster. So how likely will this see play? It's much too slow for Pirate Warrior, so that option is out. It might be a good option for Control Warriors as the game is reaching its final turns. 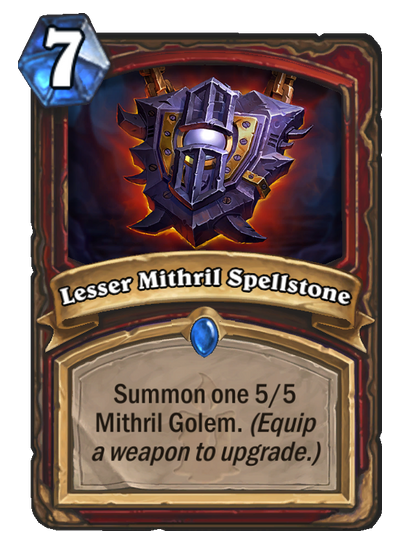 It's unlikely to win any games by itself, but Greater Mithril Spellstone should be a strong late-game option. Just be careful, because Priest players will eat this for breakfast with Dragonfire Potion and Shadowreaper Anduin. Battlecry and Deathrattle: Recruit a Beast. Analysis: Here's the Hunter's first Legendary for this expansion. And like several other cards in this expansion so far, how effective it looks ultimately comes down to your opinion on the new Recruit mechanic. This specifically recruits Beasts, which actually should fit into Hunter Deathrattle decks. 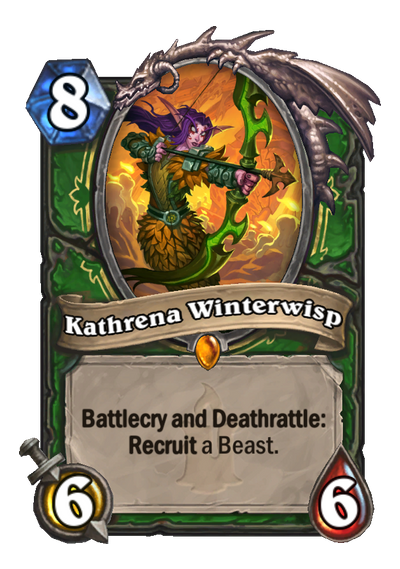 Pulling out Savannah Highmane is obviously aces, but given how dependent Hunter is on those early Alleycat and Crackling Razormaw plays, a Kathrena play is every bit as likely to whiff and whiff big. It's looking like it's going to be far too risky to take a chance on this Legendary, because a Turn 10 Kathrena doesn't do much good when it pulls out a 1-mana 1/1. The card reveals are underway, so keep visiting Shacknews for more card analyses. We'll also be breaking down the Legendary weapons individually in the coming days. Hearthstone's Kobolds & Catacombs expansion is set to release in December. Dustbreaker is bonkers powerful. Priest has so many tools to deal with aggro now. It’s really getting out of hand. A healthy meta should have viable aggro decks. 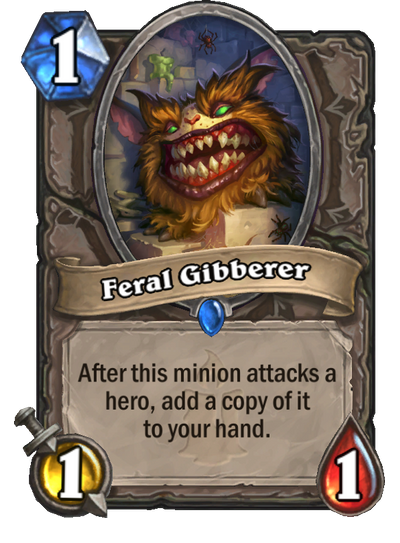 I think aggro Druid has low key been the best deck in the game for a while now and it’s not going to be playable with this card in existence.